As her mother’s memory fades, one writer watches it go, one handwritten note at a time. The woven basket with its tight-fitting lid had been sitting on my mother’s desk for years, but I’d never thought to open it. How that was possible, when I have always been a snoop (I knew exactly what was in her desk drawer: a checkbook, the key to the Biedermeier cabinet and a watch that had belonged to my grandfather), I can’t say. But when my mother was diagnosed with Alzheimer’s disease, I drove to her house and finally opened that basket. Inside, written on loose slips of paper, each dated meticulously in her elegant, looped script, were rows of names. 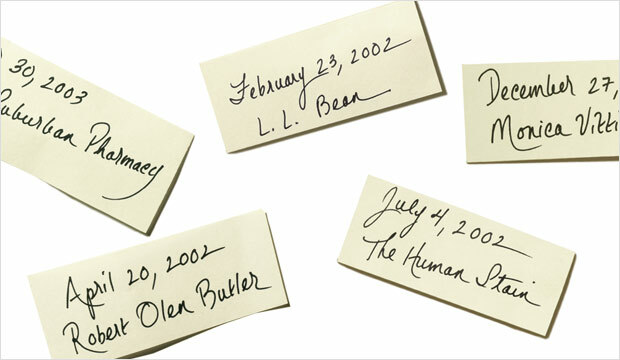 Ten or twenty times, she’d written the same name or phrase across the page. The names of friends and of their children; of books, such as The Human Stain; of authors, including Peter Matthiessen, whom she’d met at a dinner party; of the philosopher Ludwig Wittgenstein; of stores, like L.L. Bean and Sears; and the name of her drugstore, Liggett Suburban Pharmacy, in West Hartford, Conn.
My mother kept journals, letters, even carbon copies of letters she had sent. She loved to jot down quotes from books, playground chatter she had overheard and cocktail party anecdotes. But it wasn’t until her early seventies, when Alzheimer’s struck, that the basket appeared on her desk. I realized that my mother retained what was essential for as long as she could, then entrusted to foolscap the names of things her mind had discarded. After she had forgotten the name of her pharmacy (“It’s on the tip of my tongue, just give me a moment”), she still knew the way there. And Ludwig Wittgenstein? I held his name on a scrap of paper, like a ticket admitting me to the carnival of her disease, and sadly marveled at the irony of her squirreling away the name of the philosopher who wrote about unsayable things and language pointing beyond itself toward silence. When the name of the actress Monica Vitti was added to the basket, Vitti’s name was no longer necessary, though my mother retained a quote from one of her films. Vitti had been my mother’s favorite film star, particularly for her performance in Michelangelo Antonioni’s Red Desert. Years before she had Alzheimer’s, my mother identified with Vitti’s anguished portrayal of a woman unraveling in an existential crisis. I thought she was asleep, her head hanging toward her chest, but then she lifted it and her half-closed lids opened, and there it was, a flicker, a force, knowledge. Nodding her head, she quoted Vitti’s line, “Everything that happens to me is my life.” She had a wry smile on her face, as if she were stating not the tragedy of her life, but the paradox. It was not the name she retained anymore, only the truth. Then she lowered her head to rest. As a daughter discovers, her mother’s personality seems to drift, but she still can appreciate the important things: a wonderful sentence, the snow as it falls outside her bedroom window. Brain surgery unexpectedly impaired a writer/illustrator’s abilities to speak, read and write, leaving her to wonder if she would ever get her old self back.